USS Valley Forge was built at Philadelphia, Pennsylvania, after a war bond fundraiser there. Named for the Revolutionary War encampment of the same name, this ship was commissioned in November 1946. In 1947, she transferred to the Pacific fleet. After making a round the world cruise in the late 1940’s, the ship was deployed to the Western Pacific. She was the only aircraft carrier in the region when the Korean War broke out in June of 1950. She served four separate combat tours during the next three years. In October 1952, her hull number changed to CVA-45. The ship began to show the age of her design as aircraft became heavier and faster. In January 1954, she was re-designated as an anti-submarine support carrier. This changed her hull number to CVS-45. With this change, she moved into the Atlantic and served the next few years there. 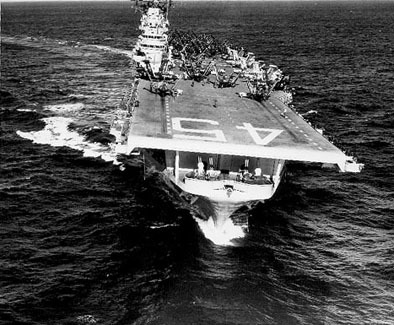 In 1961, Valley Forge got her fourth designation as an amphibious assault ship. This changed her hull to its final form of LPH-8. She was stationed in the Pacific carrying helicopters for Marines. From 1965 through 1969 she worked supporting combat operations during the Vietnam conflict. The ship was decommissioned in 1970.